Jamshidi, R., Moadi, M. (2017). Reliability Based Maintenance and Human Resources Work-Rest Scheduling in Manufacturing System. 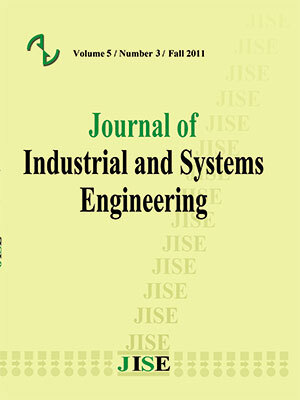 Journal of Industrial and Systems Engineering, 10(special issue on Quality Control and Reliability), 109-124. Rasoul Jamshidi; Mansooreh Moadi. "Reliability Based Maintenance and Human Resources Work-Rest Scheduling in Manufacturing System". Journal of Industrial and Systems Engineering, 10, special issue on Quality Control and Reliability, 2017, 109-124. Jamshidi, R., Moadi, M. (2017). 'Reliability Based Maintenance and Human Resources Work-Rest Scheduling in Manufacturing System', Journal of Industrial and Systems Engineering, 10(special issue on Quality Control and Reliability), pp. 109-124. Jamshidi, R., Moadi, M. Reliability Based Maintenance and Human Resources Work-Rest Scheduling in Manufacturing System. Journal of Industrial and Systems Engineering, 2017; 10(special issue on Quality Control and Reliability): 109-124. In today's competitive market, all manufacturers attempt to improve their maintenance policy in order to decrease the cost of failure and increase the quality of products, but most of these attempts do not consider the role of humans involved in a manufacturing system. Human resources are the main factor in manufacturing that has an undeniable effect on products quality, machines reliability, safety and maintenance policy. In this paper we propose a nonlinear mathematical model that optimizes the maintenance policy considering the humans fatigue to investigate its effects on reliability and associated Costs in manufacturing system. That is to say, the model is a reliability based maintenance optimization that aims to maintain the reliability of machines and their human resources in a proper predetermined interval. The performance of the proposed model was examined by some instances and the obtained results indicated this model can provide effectiveness maintenance policy for manufacturing systems. Azizi, N., Liang, M. and Zolfaghari, S. (2013), ‘Modeling Human Boredom at Work: Mathematical Formulations and a Probabilistic Framework’, Journal of Manufacturing Technology Management, 2013, 24 (5), 711-746. Baines, T.S., Asch, R., Hadfield, L., Mason, J.P., Fletcher, S. and Kay, J.M. (2005), ‘Towards a theoretical framework for human performance modeling within manufacturing systems design’, Simulation Modeling Practice and Theory, 13(6), 486-504. Bechtold, S.E. (1991), ‘Optimal work-rest schedules with a set of fixed-duration rest periods’, Decision Sciences, 22, 157–170. Bechtold, S.E. and Sumners, D.L. (1988), ‘Optimal work–rest scheduling with exponential work-rate decay’, Management Science, 34(4), 547–552. Bechtold, S.E., Janaro, R.E. and Sumners, D.L. (1984), ‘Maximization of labor productivity through multi-rest break scheduling’, Management Science, 30, 1442–1458. Cappadonna, F.A., Costa, A. and Fichera S. (2013), ‘Makespan Minimization of Unrelated Parallel Machines with Limited Human Resources’, Procedia CIRP, 12, 450-455. Dawson, D., Noy, Y.I., Härmä M., Åkerstedt, T. and Belenky, G. (2011), ‘Modeling fatigue and the use of fatigue models in work settings’, Accident Analysis & Prevention, 43(2), 549-564. Godwin, G.U. and Aniekan, A.E. (1999), ‘Human factors affecting the success of advanced manufacturing systems’, Computers & Industrial Engineering, 37, 297-300. Griffith, C.D. and Mahadevan, S. (2011), ‘Inclusion of fatigue effects in human reliability analysis’, Reliability Engineering & System Safety, 96(11), 1437-1447. Guadalupe, M. (2003), ‘The hidden costs of fixed term contracts: the impact on work accidents’, Labour Economics, 10(3), 339-357. Hsieh, A. and Chao, H. (2004), ‘A reassessment of the relationship between job specialization, job rotation and job burnout: Example of Taiwan's high-technology industry’, The International Journal of Human Resource Management, 15(6), 1108-1123. Jaber, M.Y., Givi, Z.S. and Neumann W.P. (2013), ‘Incorporating human fatigue and recovery into the learning–forgetting process’, Applied Mathematical Modeling, 37(12–13), 7287-7299. Jamshidi, R. and Seyyed Esfahani, M. M. (2013), ‘Human resources scheduling to improve the product quality according to exhaustion limit’, Top, Article in press. Jiang, B., Baker, R.C. and Frazier, G.V. (2009), ‘An analysis of job dissatisfaction and turnover to reduce global supply chain risk: Evidence from China’, Journal of Operations Management, 27(2), 169-184. Konz, S. (1998), ‘Work/rest: part II – the scientific basis (knowledge base) for the guide’, International Journal of Industrial Ergonomics, 22 (1–2), 73–99. Koo, J., Kim, B.I. and Kim, Y.S. (2014), ‘Estimating the effects of mental disorientation and physical fatigue in a semi-panic evacuation’, Expert Systems with Applications, 41(5), 2379-2390. Kopardekar P. and Mital, A. (1994), ‘The effect of different work-rest schedules on fatigue and performance of a simulated directory assistance operator’s task’, Ergonomics, 37 (10), 1697–1707. Lodree, E.J., Geiger, C.D. and Jiang, X. (2009), ‘Taxonomy for integrating scheduling theory and human factors: review and research opportunities’, International Journal of Industrial Ergonomics, 39, 39–51. MacCarthy, B.L., and Wilson, J.R. (2001), ‘Human performance in planning and scheduling. London’, Taylor and Francis. Mahdavi, I., Aalaei, A., Paydar, M.M. and Solimanpur, M. (2010), ‘Designing a mathematical model for dynamic cellular manufacturing systems considering production planning and worker assignment’, Computers & Mathematics with Applications, 60(4), 1014-1025. Martorell, S., Villamizar, M., Carlos, S. and Sánchez A. (2010), ‘Maintenance modeling and optimization integrating human and material resources’, Reliability Engineering & System Safety, 95(12), 1293-1299. Mason, S., Baines, T., Kay, J.M. and Ladbrook, J. (2004), ‘Improving the design process for factories: Modeling human performance variation, Journal of Manufacturing Systems’, 24(1), 47-54. Siddiqui, M.H., Iqbal, A. and Manarvi, I.A. (2012), ‘Maintenance Resource Management: A key process initiative to reduce human factors in aviation maintenance’, Aerospace Conference, IEEE, 1(7), 3-10. Smith, Ch.O. (1976), ‘Introduction to Reliability in Design’, McGraw-Hill, 1976. Taylor, J.C. (2000), ‘The evolution and effectiveness of Maintenance Resource Management (MRM)’. International Journal of Industrial Ergonomics, 26, 201-215. Wang, H., and Hu, S.J. (2010), ‘Manufacturing complexity in assembly systems with hybrid configurations and its impact on throughput’, CIRP Annals - Manufacturing Technology, 59 (1), 53–56.